Benchmark Printing has been in business since 1984. From start to finish, we focus on quality and no job is too small or too large. We cater to your needs; we provide recommendations and opinions to make sure that you are satisfied with the job. You tell us what you want, we create it. It's that simple. Seriously, making the printing process fun from beginning to end! 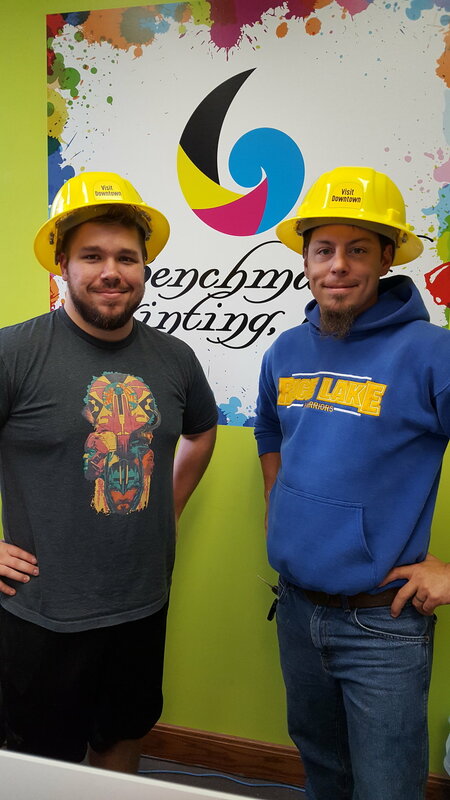 Jake started printing at Benchmark Printing in 2007, and purchased Benchmark Printing from Paula Juza in March 2018. Josiah was born and raised in Barron, Wisconsin, and graduated from Barron High School in 2011. He has worked as a wedding DJ, is currently the weekend morning announcer at the Koser Radio Network, has directed and produced two short films and has several years experience in the area of photography, videography, editing and design. Josiah has a dog named Bernie, hosts a film review podcast with his two brothers and enjoys listening to music, watching movies, reading and spending time with friends. Josiah started working at Benchmark in 2018.